Guys! It’s spring! It’s almost April and it’s really spring! It’s also sleeting right now, because that’s what spring means this year! Yeah, it’s not really nice out at the moment. We’ve had rain for days up here in Massachusetts, flooding the rivers and creeks with snowmelt, and the temperature is still hovering around the freezing point. I’m sure you’re tired of everyone complaining they’re tired of winter, but…ugh. Let me just add my voice to the chorus. That doesn’t mean we have to put up with it, though. 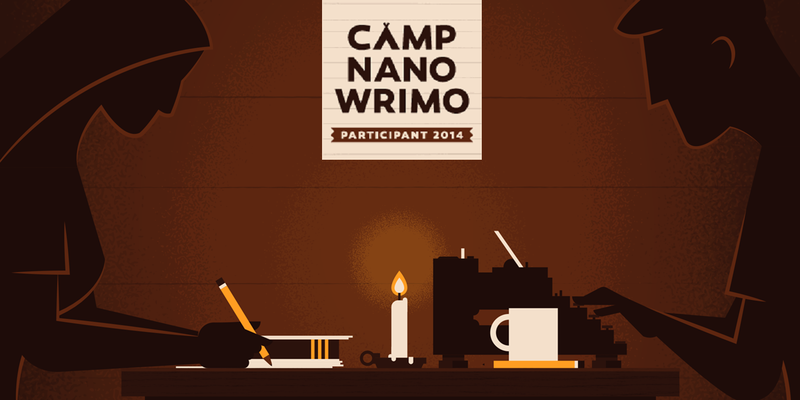 April is upon us, and that means that the first session of Camp NaNoWriMo is ready to go. Have you signed up yet? Here are a couple of reasons why you should. My tippy-top absolute favorite feature of Camp NaNo is that you get to set your own word count goals for the month, which makes it so much more inclusive for slower writers or first-timers. Don’t think you can stretch for 50K? That’s no problem at all. Set your goal to 15,000 or 30,000 if you want something more manageable. Think you’ve got what it takes to be an overachiever? You can reach for 100,000 and the word count interface will accommodate your ambitions. You can also select from a whole bunch of different project formats. You can write a poetry collection or a screenplay or a book of short stories, and no one will look down their noses at you for being a rebel. While the humongous message boards of November NaNo are wonderful for collaborating, stealing ideas, wasting time, procrastinating, and stalling, there’s something nice and cozy about the new cabin set-up. You get matched with other writers in your genre, usually, and have your own private message stream to compare notes and cheer each other on. You also get to see who has dropped out after week one, which helps you feel superior (but don’t tell anyone I said so). While November NaNo is all about the joy of participation, I won’t say that it’s 100% stress-free. 50,000 words is a serious goal for most people, and the failure rate can discourage a lot of budding writers from trying again. The friendly flexibility and off-season freedom of Camp might be a good alternative for those who feel like NaNo is just too much for them. And if you can’t make it in April, there’s another session later in the summer for another try. Do you really need another excuse to stay out of the cold and the rain? Seriously. Do you? Because this is a good one. So bundle up, hunker down, lock your doors and open your laptops. Camp NaNoWriMo is in session. Good luck with it! 😀 Sounds fun and hard work.